Antenna Experts have many years of experience in SATCOM antennas field and are able to offer array systems to suit any type of requirements. Antenna Experts offer SAT series SATCOM antennas which include dual mode UHF line-of-sight (LOS) and UHF SATCOM antenna which is ideal for SATCOM On-The-Move (SOTM) operation and SATCOM antenna with extended gain along with phased array in dual or quad stacked mode. The line of sight antenna is used for communicating with satellites low on the horizon. Our all SATCOM antennas can be used with most tactical Multi-Band, Multi-Mode Receivers (MBMMR), as well as all airborne and ground transceivers that accept a 50 ohm antenna impedance. The SATCOM Antennas can be connected to two radios to provide two simultaneous SATCOM – Satellite high angle coverage and standard LOS - Line-Of-Sight low angle air-to-air or air-to-ground communications. SAT-225-400 antenna combines the features of a two-port dual function high angle (RHCP) and low angle (Linear - Vertical) antenna system that is suitable for installation on vehicular, shipboard and ground shelter applications. No diplexer or switching is required. These SATCOM antenna are sturdy, rugged all weather model, uses 6063T6 ultra corrosion resistant architectural aluminum alloy and does not require any field tuning or adjustments. The compact size of omni-directional SATCOM antennas allows easy handling, shipping and highly suitable for transmitting, receiving without having the requirement of multiple antennas. The SATCOM antenna features high suppression of skin current which provides the constant and superior performance over the specified frequency band. Due to sturdy design the SATCOM antennas are highly suitable for fixed station application, shipboard mounting and mobile application. Our CY-225-406D rugged dual stacked , high gain, all weather crossed elements dual stacked yagi antenna is designed for satellite communication (SATCOM) application with right hand circular polarization. Dual stacked circular polarized yagi array can be used with most tactical Multi-Band, Multi-Mode Receivers (MBMMR) and ground transceivers for Ground-To-Air circular polarized satellite communication (SATCOM) application. The SAT-225-440R uses extended stubs to provide the greater gain while maintaining the wider beam-width. This high-gain low-profile antennas use Circular Polarization Antenna Technology - which delivers better penetration through obstruction and interference. The SAT-225-400R helical antenna is highly suitable to provide the uninterrupted communications from ground to air communication. This commercial grade antenna provides superior performance as compare to significantly larger and more expensive products. 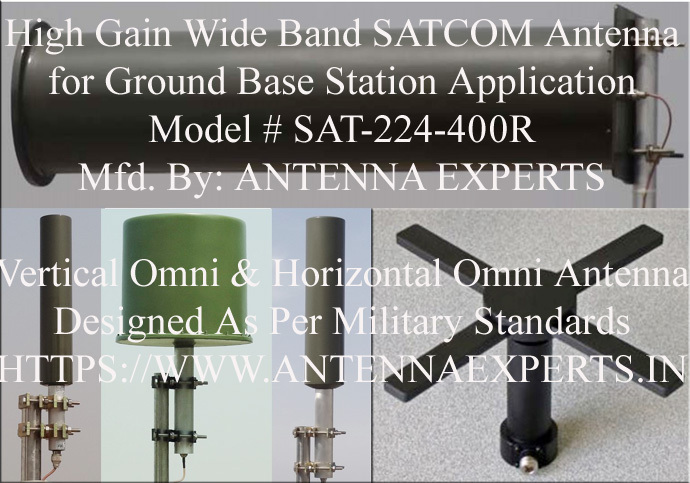 Our SAT-225-400R helical antennas are smaller than conventional yagi antenna. The SAT-225-400R Helical Antenna is supplied with a specially designed mounting arrangement to hold the antenna at back end by using two stainless steel mounting brackets to withstand the higher wind rating. Optional: A mounting arrangement to support the antenna from front end can also fixed to handle the high wind pressure created by high speed trains. Both LHCP and RHCP models are available. The part number for LHCP version is SAT-225-400L and SAT-225-400R is for RHCP version. The SAT-225-400R, like all our AH series helical antennas, utilizes right hand circular polarization to minimize the effects of multipath interference. 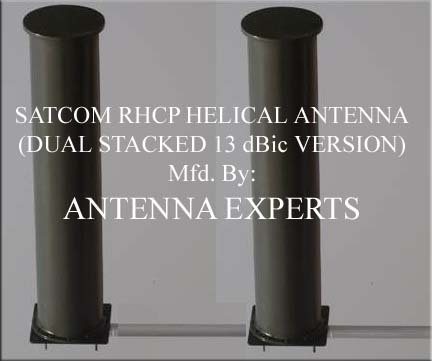 The SAT-225-400R Helical Antenna is heavy duty, broadband and rugged helical antennas, supplied with fiberglass radome to protect the antenna from environment. Cylindrical enclosure is used for low wind loading and for minimal effect of ice formation on the helical antenna operation as well as providing an aesthetically pleasing appearance. Optional: Two drain holes can be provided at the bottom surface of helical antenna enclosure. The marine grade type 316 stainless steel mounting brackets are supplied with the SATCOM antenna.